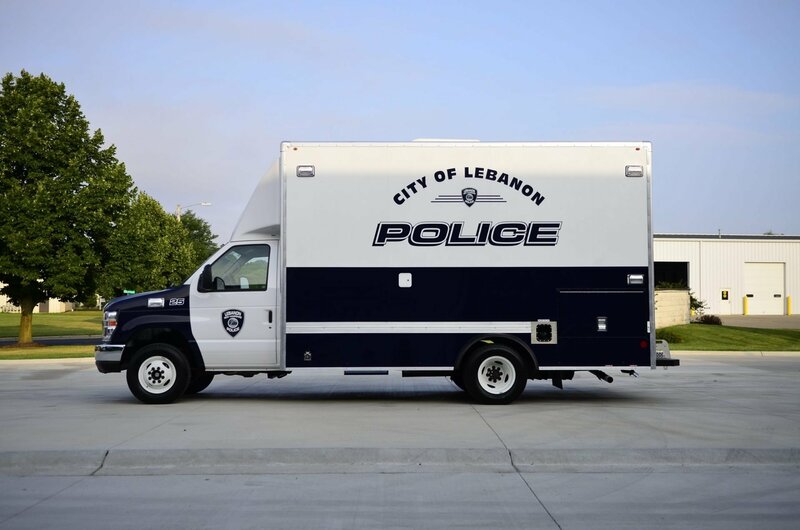 The Lebanon Police Department chose a Ford E-450 Commercial Cutaway chassis for their mobile command center/rapid response vehicle. The truck is powered by a Triton V10 (gas) engine and features a 6-speed automatic transmission with overdrive. Inside the vehicle there are three workstations, curb-side and rear vehicle access points, custom fabricated aluminum cabinets for storage, durable laminate countertops, fixed bench seating with removable cushions for additional storage and more. A low-profile rooftop A/C was installed and two wall mount electric heaters. Electric power is supplied by an Onan Commercial 7kW generator housed within a custom fabricated generator box. A retractable awning provides shade. A complete emergency lighting and siren package was integrated into the vehicle as well.